Sometimes you need a change in your life and moving to foreign country and finding a new job can give you this change. However, the panic of adapting to a new role, meeting new people and living in a new city, can be daunting. There are many interesting countries to go move to, but there is one that stands out from the rest: Prague. In the last couple of years, many people have moved to Prague to start a new life. There are plenty of reasons but the main motivation is that Czech Republic is the country with the lowest unemployment rate in Europe. Let’s talk about Prague. The capital city of Czech Republic is the most populated of the country and one of the most important cities in Europe. Prague is known for the historical center with colorful baroque buildings, the beautiful neighborhoods and the gothic churches. The contrast between the unique medieval architecture and the modern life with music, fine dining and events, make it an excellent place to live. Moreover, this city is noted for the good level of education, having a high number of universities. - In the country, the Ministry of the Interior handles immigration, but check if your bank charges a reasonable amount for international transactions. Make sure you can access your funds, but later set up your new account in Prague to prevent losing money via exchange rates and fees. - Do the same with your phone provider and be sure that your phone is unlocked to use overseas, so you can stay in touch with everyone from the start. - Research and look for the area in which you want to live. It is well to know that the center of the city is not very big, and there are different areas and neighborhoods. The accommodation just in the center is relatively expensive so it is better to research in some areas within 10 or 15 minutes from the center Vinohrady or Zizkov are good options. - Be ready and ask all your doubts in Facebook groups about accommodation, economy, places to go, types of food… You can meet nice people and future good friends in these groups and at the recommended places! - Don’t forget to buy adapters for your electronics before you go to Prague. It is much easier to looking for it than abroad. - Czechs love the enthusiasm and interest of the new residents, who attempt to speak Czech, even if it is just the typical words or phrases! - Getting the driving license in Prague is difficult. If you have an International Driving Permit you can legally drive in the country for three months after you arrive there, so you will have to secure a Czech license if you intend to stay longer. - In spite of this, the public transport system is well managed. It is cheap, efficient, clean and easy to use! - Forget the public transport and just walk around the small and beautiful places you will not see if you go by car or bus. Look for parks and enjoy the nature of Prague! 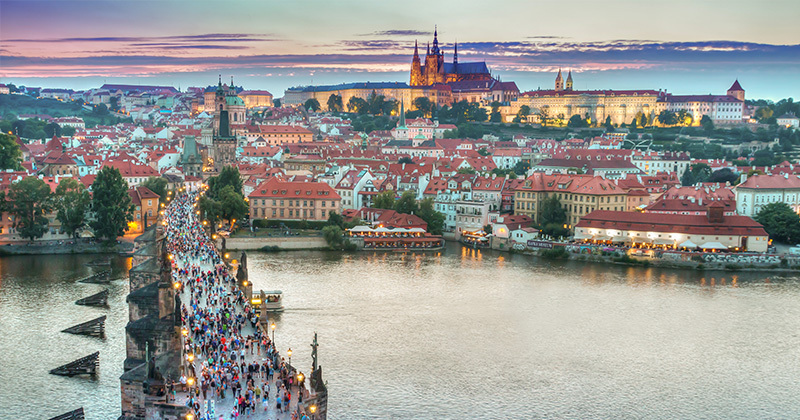 - Discover incredible sights such as the Prague Castel, the Astronomical Clock, the Charles Bridge, the National Gallery or the Saint Vitus Cathedral. Enjoy the good classical music! - Don’t be afraid of using English to communicate with Czech people. It is clear that they appreciate your interest to speak Czech, but is understandable that learn a new language from zero is not easy. - Take the opportunity to meet people from other countries. In Prague there is a lot of tourism and immigrants that are in the same position as you and can lend a helping hand. - Join outdoor activities to enjoy the nature with amazing mountains and forests. According to the season, you can choose between diverse activities. In the summer, it is popular to cycle around the countryside or hike. However, in the winter you can participate in downhill skiing or crosscountry skiing, if you dare. Be that as it may, starting a new life in another country is always a complicated decision for your future, but do it if you are feeling that way. What is clear is that before you go abroad you should be informed and ready for all the things that will come. If you want to start a new life in a European country, Prague is definitely a top destination. Be brave and remember all the tips that will help you to be happy there!